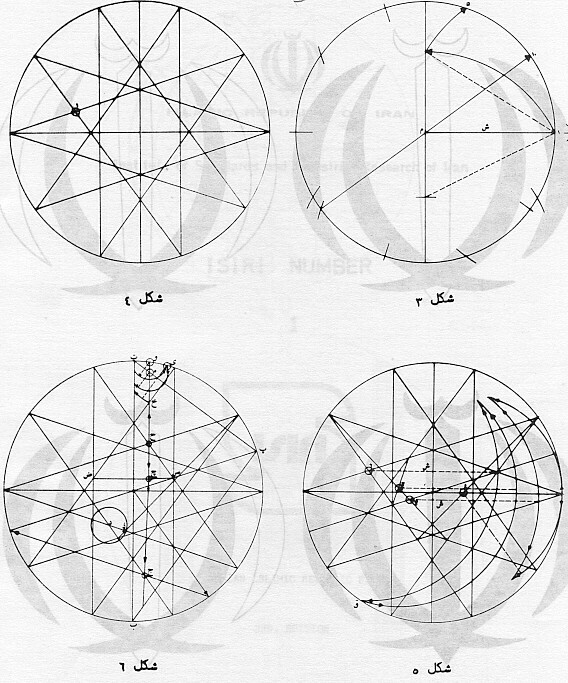 Apparently, Hamid Nadimi, who also, apparently, co-chaired the standardization committee working on the flag standard designed the original standard which was published about 1981 (In the Solar Hejri year 1349 but which seems to be a typo for Solar Hejri year 1359). 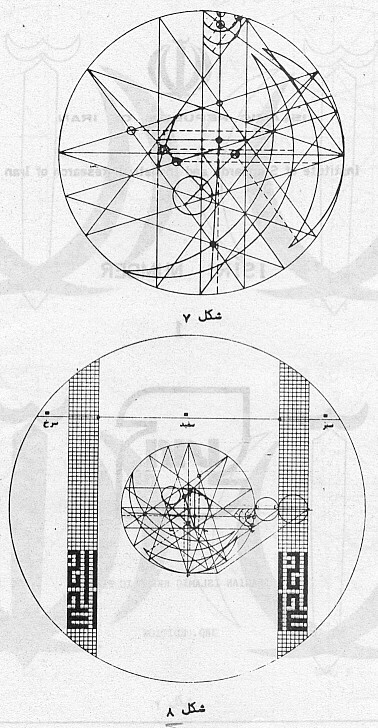 We will use for the following construction the 3rd edition from the Solar Hejri year 1371. The values of the given distances in this picture are only approximate ratios / values! The ratio of the flag is officially defined to be 7:4 regardless of the designed flag ratio. the flag consists of three horicontal strips colored in green, white and red, which equally divide the height of the flag. the flag's width is made up of exactly 225 squares, which can be divided up into 3+11*(19+1)-1+3 squares, so that this defines eleven times the position of a "Allahu Akbar" pattern of width of 19 squares. Originally this 7x19 pattern fills out a certain fraction of the height of a (red and green) strip and so implicitly (distance of 7 squares is fixed) defined the flag's ratio to 1.7477...:1. Later this was effectively changed to exactly 1.75:1 with the consequence that the Tribar now occupies a bit more than one 7-th of a strip now. Read it form top to bottom and from right to left! 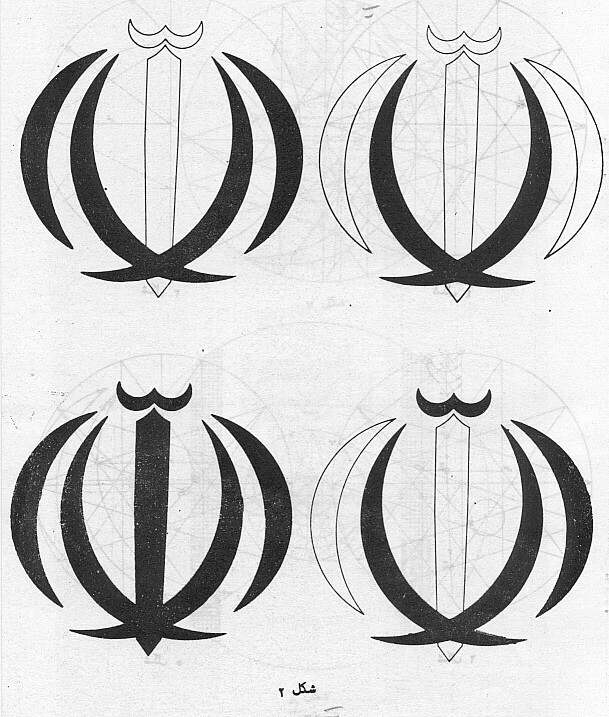 Lower right shows the construction of the two larger cresents in the emblem Upper picture shows the construction of one half of the sword. placement and size of the Coat of Arms inside the flag. 1) positive x-axis pointing right and positive y-axis pointing down. 2) circle with radius 1 given with center in (0,0), called the "unit-circle"
The distance ZZ' is the height of the Takbir, i.e. ZZ' = WV = W'V' in the picture. Knowing the size of a square implies, the flag's width, which is made up of 225 squares, equals 45*sqrt(10-2*sqrt(5))*(30-10*sqrt(5))/56. Using the calculated relative flag-height we would get a flag-ratio of 75*(7*sqrt(5)-15)/28 = 1.7477031495496... = [1;1,2,1,26,2,5,1,15,...]. This irrational number has a periodic continued fraction whith period length 1660, starting after its very first coefficient. Comparing the officially defined 1.75 flag-ratio to its designed ratio, this means a distortion of about 0,13 %. Remark: This page sprang of a private working paper which was not intended for publication. Sorry, for the plain layout. First time calculated on 2012-06-18. English translation (interpretation) of the official construction sheets Thanks to Juan Manuel Villascan. Please send any comments or questions to webmaster.